Severely abused as a child, Dr. Grant Chapman is a multi-phobic computer genius who believes in NASA's mission to far space, but is too afraid to make the trip. His best friend—NASA rogue, con artist, and trouble-shooter, Billy Jepler—drugs Grant and launches him into space. When Grant emerges from stasis, he finds the other nauts dead, a section of the ship battered shut, and the ecological balance of the Galileo threatened. His only companions are two miniature poodles and SINDAS, the ship's self-initiating, yet common-sense-challenged, computer. 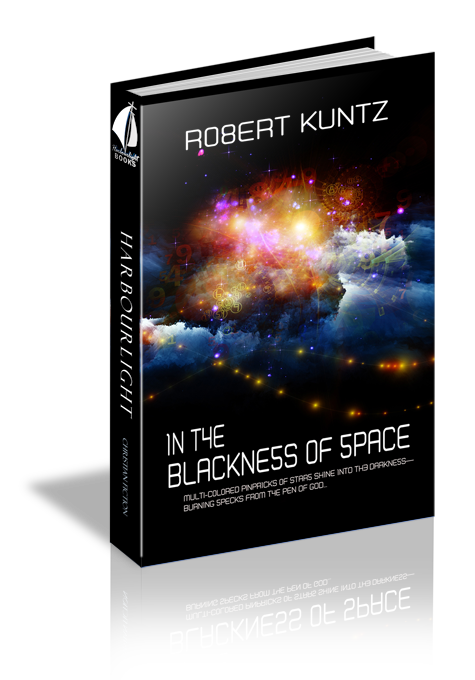 In the blackness of space, Grant confronts his fears and finds a power that challenges the traumatic memories of his abuse. Houston, Texas, January 4, 2052 (Launch minus 15 days), 08:07 CST. Blackness charged the edges of my vision, blurring the walls of the diner. I felt the sweat coming. I hated blacking out in public. Taking slow, deep breaths, I forced myself to look across the table at him. “Never.” Somehow, the word escaped my clenched teeth. My voice rose, “I will never ride in a car. Or bike or bus or train. I’ll never leave Earth.” I took a long, steady breath, trying to quiet my pounding heart. Billy was dressed in a black power suit. Even though he was overweight, with an unruly head of black hair, his serious persona had a sobering effect on people. You could joke with Billy Jepler, but you never bluffed, bullied, or blathered. My heart settled. I looked around the dimly-lit diner. The shades were pulled down, blocking the small square windows in front. A ceiling fan turned lazy circles overhead. The only other customers were back by the kitchen. A broad-shouldered man of inexhaustible energy, Billy had a boyish face with steel blue eyes. Plump like the donuts he was savoring, he reminded me of a throbbing number 8. I was like a tepid number 1, a bean pole with straight hair and a thin nose. Billy pointed a beefy finger at me. “My question is not ‘Would you go to FarSpace?’ My question is ‘If you had them over a barrel, what would you ask for?’” He glared at me, but then raised an eyebrow. “I’m not going!” Sweat soaked my forehead. I focused on my breathing. Five seconds in, five seconds out. Slow seconds in, steady seconds out. Your feet are on the ground; you’re OK. I looked down at the ancient rust-colored linoleum, cracked and buckled like a Martian landscape. I was surprised Billy had asked me to breakfast. Two days ago, Manny Weppler, the computer specialist on the Galileo’s crew, had a prolonged seizure during a launch simulation. He was in the hospital, on a ventilator, diagnosed with mission-disqualifying California encephalitis. Billy had to be going crazy to find a replacement. I’d known Jepler for ten years. He was the master of multi-tasking, working on dozens of projects at once. Billy’s deals, cons, trades, and larceny had saved the program countless times. We had a vision to send people deep into space, to planets where humans might live. With the president-elect promising to end FarSpace on his first day in office, we had to launch in two weeks. I picked up my orange and then peeled and sectioned it. The four sections without seeds I put on the right side of my plate. The six sections with seeds on the left. Using my fork, I pierced those with seeds and worked the seeds out. I lined up the fifteen seeds in three rows of five. They reminded me of pungent, miniature number 9s. “Whoever established those miserly weight restrictions doesn’t have the intelligence God gave kumquats. The nauts are risking their lives. They’re the most important element in the whole mission. You don’t send people on a twenty-five-year trip into space and deny them two-hundred pounds of personal gear. If you’re loyal to your people, you let them take the stuff of their dreams. I ate an orange section from the left. The taste reminded me of my walk to Houston. On the way through Louisiana, the road went past an orange grove. I helped myself to an orange, and as I ate each section, I slipped the seeds into my pocket. With the fifteen seeds on my plate, I now had 177,215 orange seeds, 3,988 peach pits, 5,735 cherry pits, plus apple seeds. “Right. It’s not just growing crops. It’s recycling human and animal waste in a system that keeps humans, plants, and animals alive. “The ship’s ecosystem is modeled on the Biosphere II experiments of the 1990s, taking nature’s interdependent life-enhancing systems into space. The living part of the Galileo is made up of two rings, each with seven distinct biomes, one after another like beads on a bracelet. “Neither of those made the cut. The rainforest’s tropical foliage, along with the plankton and coral reef in the ocean biome, recycles CO2 back into oxygen so the nauts keep breathing. I ate another orange section from the left and enjoyed the juice trickling down my throat. I thought again of the long walk from Charleston and the seeds I’d started collecting on the way. I now had seeds from five varieties of common apples: 2,701 Cortland, 409 Grimes Golden, 3,511 Jonathan, 1741 Melrose, and 122 Albemarle Pippen. I knew if I planted them, each one would grow its own new variety. Apple seeds were like that. But I kept them nonetheless. I ate another orange slice from the left. Billy lifted a finger. “Point one, no priority higher than the nauts.” He looked at his donut and thrust out two fingers. “Point two, failsafe redundancy for every aspect of FarSpace.” Suddenly his eyes got wide, and a gleeful look passed over his face, as though he’d discovered the key to donut heaven. My arms started to shake. If I didn’t get out of this dingy place and into fresh air and sun, I’d black out. I stood from the table and glared at Billy. I’d only blacked out twice this month. First the sweat, then the shakes, and finally the system got so overloaded it shut down. I shoved open the door and lurched out into the sunshine. In 1,714 steps, I reached Travis Park, a small patch of grassy lawn bordered by thick oak trees dangling with Spanish moss. The best antidote for blacking was anchoring myself in nature. If I could sit on the bench, curl my toes in the grass, and hear the birds’ joyful singing, the shakes and sweats would fade. I was managing. Even Dr. H said so. For early January, the air was unusually hot and muggy, but the grass by the foot of the oak tree was like cool silk. A lively concert from the wrens poured from overhead. The little birds were musical number 67s, singing light into the sun. It wasn’t like Billy to pressure me. We were friends. We went on long walks together. He told me things he didn’t tell anyone except his wife, Beth. At NASA, Billy was a trouble-shooter. He fixed snarls, bottlenecks, logjams, and complete impossibilities. Billy coaxed and conned, bargained and bartered, swapped and swindled, until he got what we needed. Something was nagging me about Billy. I forced it out of my mind and looked out over the park, watching dogs tug on their leashes and squirrels tease them. At 8:52, my watch alarm beeped. I shut it off and headed to Dr. Hudson’s. Everyone on the FarSpace project meets with a shrink, even the bigs. My regular appointment wasn’t for two weeks. But Dr. H’s secretary had called me the day before, asking if I could switch. She’d given me directions to the new office. That was how I felt about smoothing code. In the zone, solutions come. The door was open when I arrived at Dr. H’s new office. The place was a small box, no windows, no room for a desk. Two beige upholstered chairs filled the room. Dr. H was sitting in one of them, and he nodded that I should take the other. He was a short, energetic man. His face was like a number 4, full of sharp angles. His fingers were long 6s, stretched into gentle curls. When he was listening intently, he’d squint one eye and bob his head forward. This new office had pictures on the walls: a white Texas longhorn lounging in a meadow of bluebells, a craggy mountain range of snow-covered peaks, a rough-hewn sailboat on a smooth river that I imagined was the Nile, and a mist-covered pond at sunrise. If he couldn’t have windows, at least he could have something to look at. Dr. H had never said anything like that before. Dr. H grinned at me and I went on, “She’s smart and interesting. She’s not one of those people who fuss over things.” I thought for a moment. “She has this wavy red hair that sways like a dancer as she walks. She’s a gentle person and kind. I think she likes me. We talk for hours and she’s not upset by my phobias. I clenched the arms of my chair. I hated talking about this. Dr. H waited, his head tilted to the side. Suddenly, I couldn’t say anything. My mouth wouldn’t work. My brain couldn’t figure out how to speak. Deep breath, buddy. Five seconds in and five seconds out. Slow and steady. Your feet are on the ground. Dr. H sat patiently. I saw a glistening in his eye and felt warmth spread through me. I took deep breaths. He’s not here. There’s no tree. It’s not going to happen. Five seconds in, five seconds out. I squeezed the arms of the chair. There was no often about it. I never knew when he would explode from the haze of drunken highs. I tried to stay out of his sight. “Ten to fifteen times a week. When I got too big for the tree, he’d lock me in a closet or shove me in the trunk of the car. He’d scream at me, ‘If I die and don’t come back for you, it’s all your fault.’” I winced from the memory of his voice and felt the blackness looming, squeezing me like I was squeezing the chair. I took deep breaths. Letting go of the chair arms, I slid my fingers onto my pulse. The steady thumping of life soothed me. In an instant, I was soaked with sweat. Uncontrollable shivers wrenched my arms and legs. Deep breaths. Five seconds in… I shut out everything but the steady pulse. I counted a lot of things, but I didn’t count my pulse, just felt the consistent, comforting throb. Self-soothing, they call it. It helps me manage. Dr. H was quiet for a moment. I felt my pulse, the reassuring beat of life, steady, confident. I looked at the longhorn in the bluebells, took a long breath, and sighed. Dr. H fished in his coat pocket for a pen. He looked at me, wide-eyed, and then reached in his pocket again. The room stopped moving. I was as dizzy as a propeller. I bent over, heaving in huge draughts of air. I danced back and forth on my feet to keep the circulation going in my legs. I glanced at the picture of the mist over the lake and stretched my fingers. Finally, I collapsed into the chair. Was he trying to make me angry? I couldn’t go there. I nodded and squeezed the green card. He reached in his pocket. The room moved soundlessly. I panted. Sweat soaked the back of my shirt. I almost ripped the green card into pieces. Then the room stopped moving. I sat and felt the steady throb beneath my two fingers until I could breathe without gasping for air. Everyone gets a card at a shrink visit. Red was the worst—you couldn’t work on anything until they treated and cleared you. I knew three people who’d gone red. Two of them left the program. The third went through months of therapy, med tests, allergen scans, and a two-week survival course. At the end, he went green, and we could see he was better for everything he’d done. If you went yellow, you could still work, but you had daily sessions and tests. If you went blue, you had to check in next month instead of in three months. Green meant that you were good to go. Question 1: In this story, as in the Bible, people are sent on a journey that's not of their choosing. Has that ever happened to you? Question 2: The seven astronauts going into space want unique things in their personal 200 pound packages. If you were going on a decade long trip in space, what personal items would you take? Question 3: Grant and the ship's Captain, Carmen, have two different reactions to being in outer space. She's filled with awe. He blacks out in fear. What would your reaction be? Question 4: Carmen experiences wonder when she sees the rings of Saturn or asteroids tumbling through space. What experiences bring you a sense of awe and wonder? Why do you think we have the capacity for these experiences? Question 5: At times, Carmen hears SeÃ±or JesÃºs whisper. Some people hear God in their mind. Others in their heart or feelings. Some people experience a divine nudge or "something told me to." Have you experienced hearing God? How can we discern the difference between what is from God and what is not? Question 6: When he comes back to consciousness on the space ship, Grant struggling with feeling betrayed by Billy Jepler. Have you ever had that kind of struggle? What was it like? What helped you work it through? Question 7: Dr. H tells Grant that we all have an adventurer in us. What adventures have you experienced in life? Are there adventures you want to take? Might God be prompting you toward any of those adventures? Question 8: In the blackness of space, Grant finds himself in the presence of God. Have you ever experienced God's presence when you were in darkness?